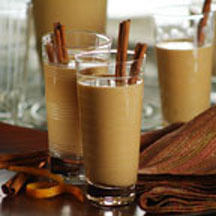 Combine evaporated milk, water, sugar, cloves and cinnamon stick in medium saucepan. Bring to a gentle boil over medium-high heat, stirring occasionally until sugar dissolves. Add coffee granules; stir to dissolve. Add vanilla extract and nutmeg. Remove from heat. Cool 20 minutes. Remove cloves and cinnamon stick. Add brandy. Pour into empty bottle. Refrigerate until chilled, about 4 hours. Tip: For a twist on flavor, a 2-inch piece of orange peel can be added when boiling milk and spices.